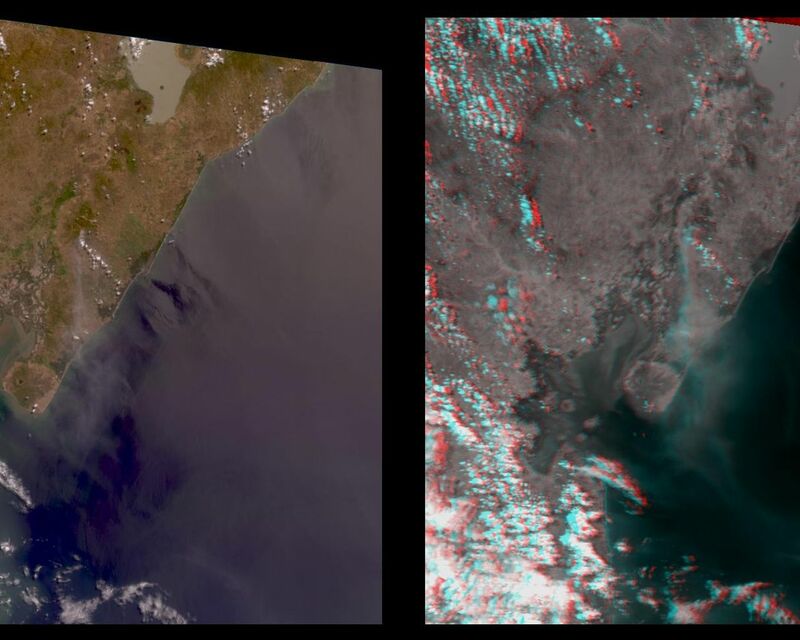 The true-color image at left is a downward-looking (nadir) view of the area around the San Cristobal volcano, which erupted the previous day. This image is oriented with east at the top and north at the left. 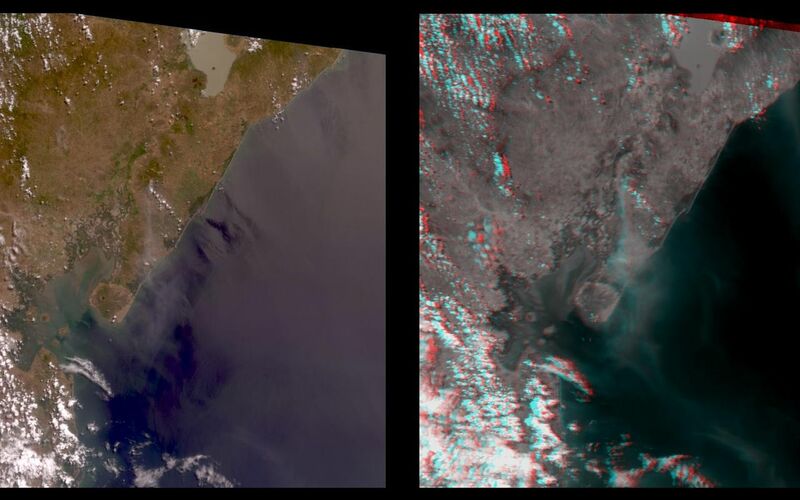 The right image is a stereo anaglyph of the same area, created from red band multi-angle data taken by the 45.6-degree aftward and 70.5-degree aftward cameras on the Multi-angle Imaging SpectroRadiometer (MISR) instrument on NASA's Terra satellite. View this image through red/blue 3D glasses, with the red filter over the left eye. 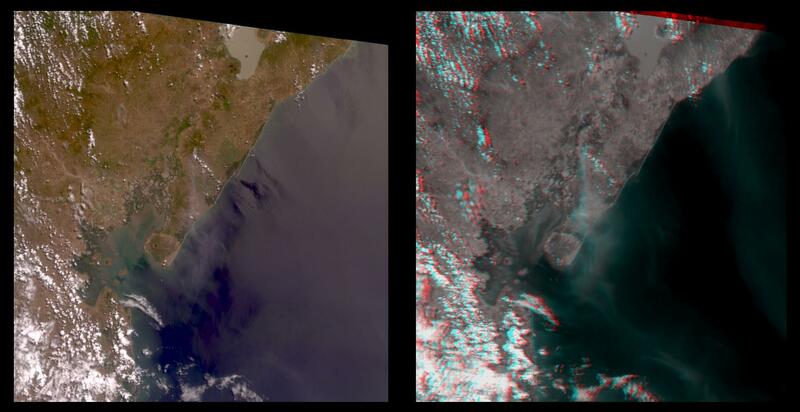 A plume from San Cristobal (approximately at image center) is much easier to see in the anaglyph, due to 3 effects: the long viewing path through the atmosphere at the oblique angles, the reduced reflection from the underlying water, and the 3D stereoscopic height separation. In this image, the plume floats between the surface and the overlying cumulus clouds. A second plume is also visible in the upper right (southeast of San Cristobal). This very thin plume may originate from the Masaya volcano, which is continually degassing at as low rate. 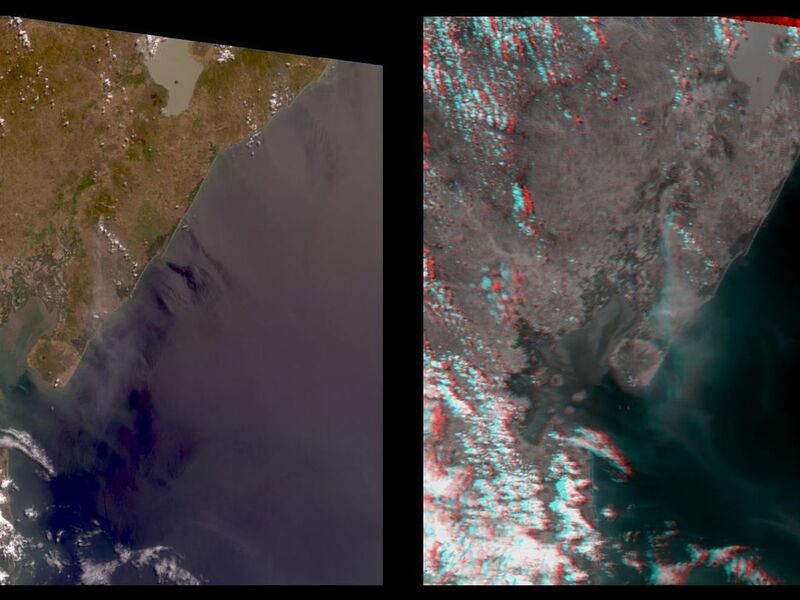 The spatial resolution is 275 meters (300 yards). MISR was built and is managed by NASA's Jet Propulsion Laboratory, Pasadena, CA, for NASA's Office of Earth Science, Washington, DC. The Terra satellite is managed by NASA's Goddard Space Flight Center, Greenbelt, MD. JPL is a division of the California Institute of Technology.